Not everyone would consider holding a business meeting in a boathouse, but Linda Kilburn’s meetings are anything but conventional. She believes that some of the best ideas originate in places of peace and tranquillity, so her colleagues and clients may well find themselves enjoying afternoon tea on the sun-dappled decking of her garden summerhouse, instead of shuffling papers across a boardroom table. When friends drop by for coffee and a catch-up, too, they are less likely to end up in the kitchen of Linda’s 18th-century house than at the bottom of her garden, sitting in comfort by the side of the lake. Not everyone would consider holding a business meeting in a boathouse, but Linda Kilburn’s meetings are anything but conventional. She believes that some of the best ideas originate in places of peace and tranquillity, so her colleagues and clients may well find themselves enjoying afternoon tea on the sun-dappled decking of her summerhouse, instead of shuffling papers across a boardroom table. When friends drop by for coffee and a catch-up, too, they are less likely to end up in the kitchen of Linda’s 18th-century house than at the bottom of her garden, sitting in comfort by the side of the lake. 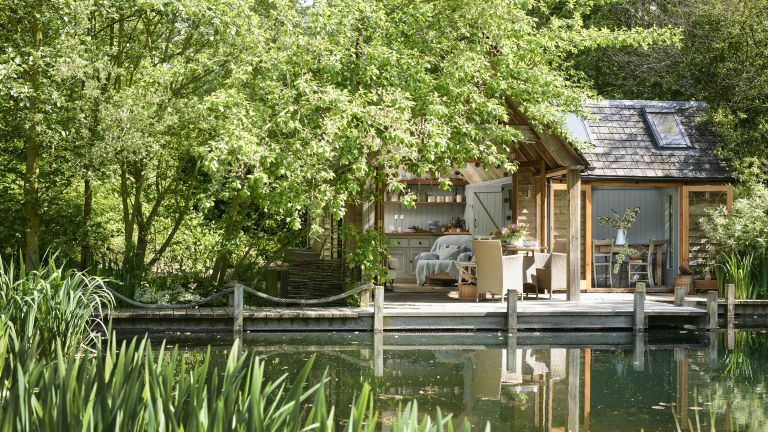 After sharing her ideas with local cabinetmaker Albert Thundercliffe, however, Linda decided to create more than just a boathouse, so asked him to build a rustic wooden summerhouse with a cedar shingle roof, containing a small kitchen area and comfortable seating. Albert added Velux windows in the pitched roof to draw in plenty of natural light, and built large glass doors across one wall so it can be opened up to the decking in summer. He then painted the wooden floors, walls and ceiling in Farrow & Ball paints, which were mixed to create the exact shades Linda had in mind. the idea of creating an extra room so they could sleep there if they wanted. ‘Unfortunately, David wasn’t so keen on that idea, so I decided to build an extension that could be used as either a dining room or a meeting room instead,’ says Linda. The second phase is designed to complement the original building, with a pitched roof and a period-style latch door joining the two. Albert made another set of fold-back doors so that the entire frontage can be opened lakeside. A graceful overhang from the original section creates a sheltered eating area in case of rain, while a wood-burning stove keeps it warm and cosy even when it’s snowing outside. It has proved the perfect spot for intimate social gatherings, and Linda’s friends love to share lunch overlooking the lake. ‘I had a small kitchen built so we could make drinks and heat up something in the microwave, but if I’m doing anything more than that I put everything I need on a golf buggy and bring it over from the house,’ she says. Linda furnished the summerhouse with pieces she already had, including a second-hand sofa, antique French farmhouse table, old school chairs and collectables. She keeps it stocked up with fresh flowers and foliage from the garden, and buys vintage crockery for afternoon teas.